The Getaria patch cables are designed to interconnect electric guitar pedal effects. Right-angle plugs allow close spacing of pedal effects on pedalboards. The right angle plug design also makes 3 pack or 6 pack an ideal fit for assembling a pedalboard to your exact specifications. They feature ultra low capacitance which lends to a pure signal transparency. The Getaria patch cables utilize ultra-pure, oxygen-free copper conductors for low capacitance and pure tone. With a single-molded strain relief plug these cables also provide added durability and reliability. A 90% spiral shielding also helps to eliminate virtually all handling noise. 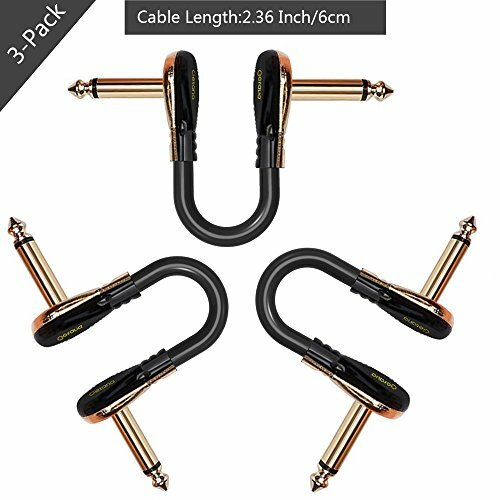 High quality audio cable, 2.36" / 6cm long save space on your pedal board, keeps it tidy and looks professional. Easy fit and adjust your different dimension of guitar effect pedals on the same vertical height or horizontal position. Solid and durable, good connection cable transmits high fidelity signal to the equipment. Using high purity copper shielding ensures extreme low noise, while the high purity copper center conductor delivers the signals as they are. The cross-linked polyethylene dielectric is heat resistant and will not shrink as quickly as PVC. Used for audio signal transmission of microphone, amplifier, mixing console and other equipment. If you want the best cable to go from your instrument to your rig, the Getaria Professional Guitar Effect Pedal Cable is the best choice. All of these cables undergo extensive listening tests to ensure they meet Getaria's standards of clarity, accuracy and quality. View More In Patch Cables. If you have any questions about this product by Getaria, contact us by completing and submitting the form below. If you are looking for a specif part number, please include it with your message.